The island of Sao Jorge is a basically a ridge rising out of the ocean and looks like a long cigar. A line of volcanoes form the central hump of the island, which falls into the ocean with tall cliffs for most of its length. Sometimes, there are flat areas called Fajas, formed either due to lava flows or massive landslides, which allow for boats to dock with the island. 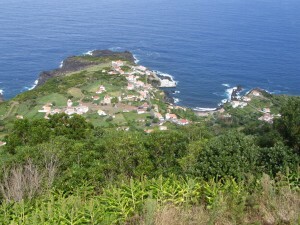 Here the earliest settlers established a foothold on Sao Jorge and began to grow crops. The microclimates of these Fajas are conducive to growing cereals and vegetables, while the slopes of the volcanic ridge are mostly used as pasture for cattle. Having arrived in Velas the previous day, I plan to climb to the top of the highest peak on the island today, Pico de Esperanza. The island is poorly connected by buses, and I have to hire a taxi to drop me off at the start of the trek . I make my way in mist along a gravel track. Through the clouds I hear the lowing of cattle and for some reason I am reminded of New Zealand. Here on the island, cattle outnumber people the way sheep outnumber the inhabitants of middle earth. I part a herd of cattle as I climb up. A brisk northern wind brings low clouds that hide much of the world from me. I pass the site where, in 1999, a SATA flight crashed into the mountainside killing all passengers and crew. Looking around at the murky clouds, I am not surprised that the pilot saw nothing till the last moment. By and by I reach the peak of hope. When I reach the top, the sun shines through, and I allow myself to be drawn into a larger narrative of a kindly god opening the clouds to give me this blessing of light. I take pictures, a video, and am thoroughly pleased with myself. As I gather my belongings for the walk down however, I notice a single slug on the path I have trekked uphill. How long had that poor creature crawled to reach this height? The clouds close up behind me as I make my way down towards Faja Ouvidor and the taxi waiting to take me home. 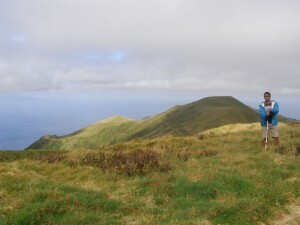 Sao Jorge is famous throughout the Azores for its cheddar-like aged cheese, which is exported in quantities to the mainland and North America. On the way back from the Faja, my taxi driver and I stop at the milk cooperative to take a tour of the facilities. We see how hundreds of gallons of milk are curdled and the curds pressed into rounds. We walk into vast temperature controlled warehouses storing hundreds of thousands of rounds, which are cured, turned, and inspected before being shipped. There is a pungent smell, and the tour guide is surprised as I sniff it up, reaching for the rounds with mould growing on them. The best cheese has a complex set of flavors and aromas, the worst a simple neat finish. Throughout my walk that morning, I had smelt mountain thyme, spearmint, and lain on banks of heather. Now I begin to comprehend how the flora of the high slopes are making their notes known through the cheese of the island. In the evening as I am relaxing and watching the local newscast on television (the best way to learn a language! ), my landlady’s son comes in to fix the leaking faucet in the bathroom. He only speaks a few phrases in English, and as I watch him try to repair the leak, he asks me where I am from. My mouth has dropped open. “My cousin live on Emerson. Three weeks this summer I live there. You like?” He’s holding up three fingers as he talks, now excited. I can barely believe the fact that in the middle of the Atlantic, in a village of 800 souls, I have come across a man who walked past my house in Toronto this summer. Renaldo now drags me down to the yard of his own house and introduces me to his wife, who speaks much better English. He begins to clean the fishes he has caught this evening as I talk to the two of them. They both love Toronto, its malls, and Renaldo tells me his favorite restaurant is “East Side Marios”. Cathy’s favorite is the Mandarin buffet. They ask me a lot of questions. Where do I party at night? What things should they see next time? Cathy brings me a glass of port wine and a bag of local sweets “espices” that her friend had made that afternoon. “No can get in store,” she tells me proudly. I watch Renaldo cut off the fins and begin scaling the fish still enraptured by the idea of being usso different yet sharing so much. Above us, the Cory Shearwaters skim the night sky like bats and beyond the village church, moonlight glimmers on the ocean channel beyond which Pico rises into the grey clouds. We talk long into the night and Cathy and Renaldo are now ashamed that I have had to pay to stay at their house. “Only if you promise to visit with me in Toronto,” I tell them. Life is really that simple here. Friends are made over wine and food, and as I sit with them, I realize that for all my education and sophistication I don’t know how to take leave of such good people. It is the truth that every islander knows someone in Canada and the USA. Cathy and Renaldo have made several trips to Toronto, to Boston and Oakland but never been to Lisbon. At last they tell me shyly that they want to live in Canada, try it out for a year, and I begin to realize that the dream to emigrate has not dimmed yet. The islands may be beautiful but jobs remain scarce and opportunities to try oneself are few. As much as their lives attract me, so does mine attract them. And with that we take leave for the night. In the morning, they will both be at work by the time I wake up, and I will leave the keys to my room in their mailbox as I board the ferry for Horta. But we will always have Toronto.